Tiger Scouts is an exciting introduction to the scouting program for first grade boys (or 7 years old) ready to get going! Tigers do stuff - lots of stuff - and all with their adult partners. This program is intended to open up the world to inquisitive minds along with the caring guidance of adults. The first steps along the Boy Scout Trail are laid here and every rank advancement through the scouting program builds on the basic activities done as Tigers. If a boy has completed kindergarten (or is 7 years old) and has earned the Bobcat Badge, he may start earning the Tiger rank. He will need a Tiger Scout handbook, Tiger neckerchief, and Tiger neckerchief slide. He will also need a blue Cub Scout Uniform. This part of the boy scout trail is intended to take one school year, preparing the scout to begin his Wolf adventures after he completes first grade. To earn the rank of Tiger Cub, you scout will need a Tiger Handbook to begin working on the Tiger Trail. Below is an outline of the material covered in the handbook. Note: The Bobcat rank must be earned before the Tiger rank, then Once a Bobcat, always a Bobcat... Once he earns his Bobcat Badge he can skip it in other handbooks as he advances through the ranks. Tiger Scouts spend their time doing adventures that move them ahead towards their Tiger rank. By completing adventures, the Tiger rank is earned. 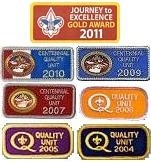 The Tiger's adult partner participates the entire way, but the recognition items are only for the scouts.